Swiss Post is at the forefront of drone development and deployment for logistics. It transports special healthcare consignments in cooperation with a range of partners in various regions of Switzerland. Together with the drone manufacturer Matternet and partners from the healthcare sector, Swiss Post is using drones to transport laboratory samples. At present, samples are transported by road. But thanks to the use of drones, transporting these samples should become more flexible, more eco-friendly and less dependent on the traffic situation. A car journey lasting 45 minutes becomes a flight of just a few minutes in the uncongested airspace, which means true added value for our customers and by extension their patients. This is because healthcare consignments in particular are often urgent and the speed at which they are delivered can be crucial. Using new digital solutions, Swiss Post is expanding its core business – transporting goods, information and people – to include new business areas. Swiss Post is a pioneer in Switzerland for autonomous and commercial drones. Drones can be deployed in many ways in logistics – above all in the last mile to transport high-priority consignments, such as lab samples, or to deliver supplies to places cut off from the outside world after a storm. However, as 130 million parcels are sent per year, the nationwide use of drones would not be expedient. This means that drones will complement traditional parcel delivery where required in the future, but they will not replace it. Swiss Post launched the drone project under the early Label. The early Label stands for innovations which Swiss Post tests and develops together with its customers. Taking to the air to serve the healthcare sector. Find out where the small white drones have been deployed so far. Swiss Post will transport laboratory samples by drone on behalf of University Hospital Zurich and the University of Zurich from December 2018. Compared to a courier on the road, the drone is able to travel the Zurich route twice as quickly, is more environmentally friendly and is unaffected by the traffic situation. The two-and-a-half kilometre route will start from a roof terrace on the north wing of USZ, arrive at UZH Irchel at Winterthurerstrasse 190 and – where possible – will fly over a forested area. Around five to ten flights will take to the air on weekdays between 7:30 a.m. and 4:45 p.m. The project is envisaged to last one year. During this time USZ, UZH, Swiss Post and the drone logistics systems provider Matternet will gather experience in long-term autonomous drone operation. Swiss Post began transporting lab samples for the ZLZ as early as June 2018 high above the Zurich lake basin. The ZLZ lab carefully evaluated the results of the tests and decided to continue deploying the drones in future. The drone needs around seven minutes to cover the route and thus arrives at the destination five times faster than conventional road transport. The Swiss premiere: this was the first hospital in Switzerland to test a drone link between two locations. Since the start of the project, more than 2,000 flights have taken place between the EOC hospital group’s two hospitals, the “Ospedale Italiano” and the “Ospedale Civico”. Today, the drone is in daily use in Lugano. 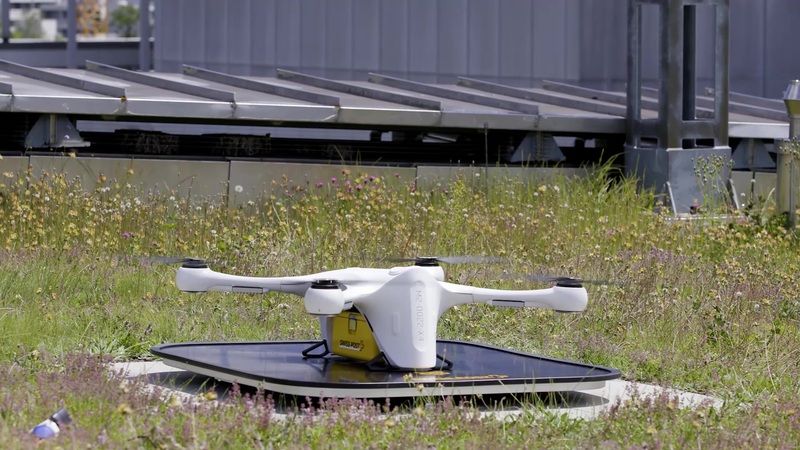 For two weeks in June, Swiss Post will use drones to transport laboratory samples between Tiefenau hospital and the central laboratory at the University Hospital of Berne on behalf of Insel Gruppe. Insel Gruppe and Swiss Post will then evaluate the flights in Berne. The findings will inform the decision whether to use drones for day-to-day transportation of lab samples in the future. Since the initial tests, there has been a great deal of interest in the use of the drones in the healthcare sector. Thanks to its wealth of experience, Swiss Post is in contact with a wide range of interested business customers. It is therefore likely that there will soon be more opportunities to use the technology. Would you like to make your logistics more efficient using drones? If so, we look forward to hearing from you.